I keep this page alive for hysterical reasons. You are visitor 14509 since 1/6/96. A VENUS Live Data applet. Or look at plots of weather data for the last month. This page may contain information about me, the research I do, other interests I have and some cool (but mostly outdated) Internet sites that you may find useful. (I developed this site before Google, and this is what we did back in the 90's) I'm glad to live in Victoria, the best place in the world! My (old) Curriculum Vitae includes details of my research career, a list of publications and descriptions of my activities over the last ten years (prior to 2010). Since 2002 I have been working rather extensively on the UVic's (now Ocean Networks Canada) Cabled Ocean Observatory Project. As the Associate Director, Science, I am responsible for supporting all the researchers using ONC observatory systems. There are about 600 at the moment. ONC has cabled installations in Saanich Inlet, the Strait of Georgia, off the west coast of Vancouver Island out the the Endeavour Segment of the Juan de Fuca Ridge (NEPTUNE), and even in the Arctic. Here are some (old 1990's) work related photographs taken during several oceanographic cruises on UVic's R/V John Strickland. Hit refresh to load all thumbnails. These are all summer shots taken in Juan de Fuca Strait from our 1996 through 1999 field work. See how he uses the spanner! Here are some pictures from 1996-2000, and from our 2001 June and 2001 August Vector cruise(s). 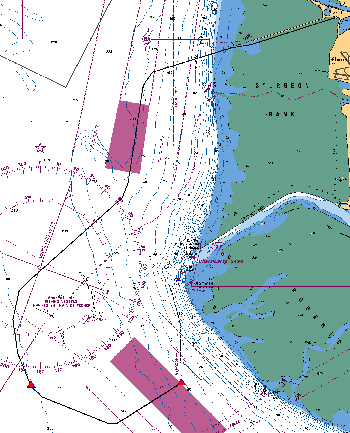 In May-June of 2001 we lost an ADCP mooring and went looking for it with ROPOS. Here are some pictures of ROPOS. The (old) Ocean Physics Group (Garrett, Dewey, Kunze, and now led by Jody Klymak) works closely with Fabian Wolk and Rolf Lueck's Rockland Scientific. Finally, I scanned some old pictures of work on the North Slope of Alaska, at Endicott. Finally, here are a few goofy pictures of just ME. For the record, (OMG! I can't believe this used to mean somthing.) after IBM's TSO (time sharing operating system), Digital's PDP-11, VAX's VMS, and MS's DOS, I was using IBM's OS/2 for a couple of years (1993-95) and was reasonably happy with the way it turned my desktop PC into a workstation. I then switched to a Pentium 133 MHz (1996), wow did it seem fast. Canuck (my computer's name, since I was a Canadian living in Seattle) then had dual cores, when that meant two 3 GHz Pentium-4 CPUs (2007). Since then, Canuck has evolved though Windows 2000, XP, and now is an 8-core Dell Optiplex 780 Windows 7/10. I use UNIX boxes only when I have to (through X-Windows), not otherwise. I never use vi! I try not to use Mac's but find my iPad convenient for emails and browsing on the road. Coastal oceanography and mixing processes, boundary layers, turbulence, tides, Lagrangian processes and fronts. These things are interesting enough, but their spatial and temporal variability are of greater interest. The Ocean Physics Group at UVic have a broad range of interests in physical oceanography. In addition to understanding physical processes in the ocean, I also like to measure lots of things and try to use observations to get a better feel for the dynamics affecting the environment. Consequently, data processing, data presentation, and computer programming (FORTRAN or MATLAB) are central to my oceanographic research. Modelling ocean processes has proven to be interesting and this controlled computer environment can be relatively calm compared to the uncontrolled real sea-going world. 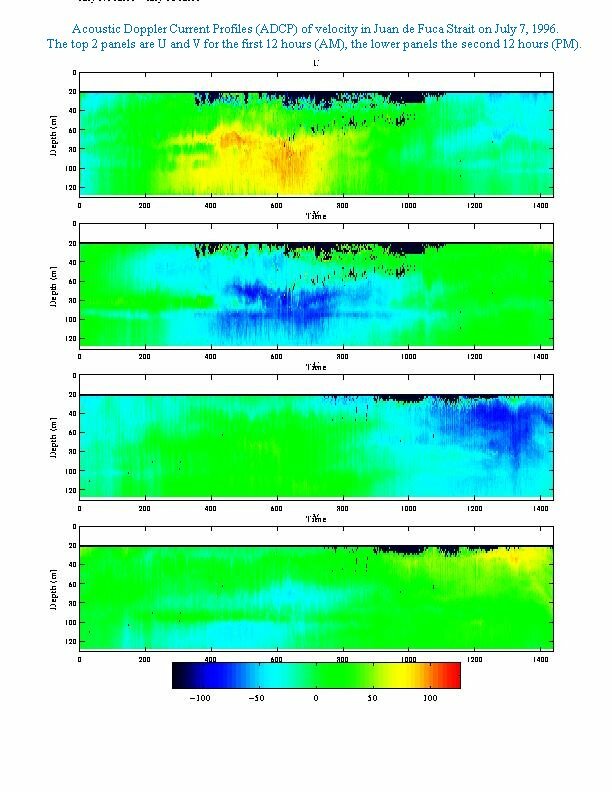 Calm however, sometimes means less than real, so models will ever replace the need for in situ measurements.This interest has led to my career involvement in the VENUS Project, a real time, online cabled ocean observatory deployed near southern Vancouver Island. I was the Associate Director, Research for VENUS, now the Associate Director, Science for Ocean Networks Canada, and I manage all the science and research components of both VENUS and NEPTUNE. 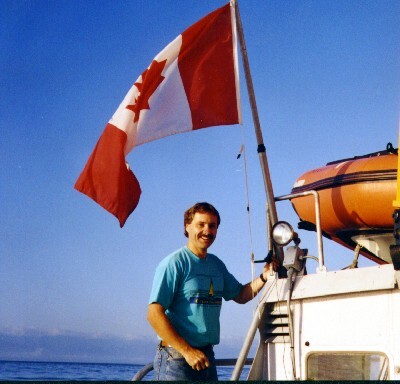 During the summer of 1996 we, (Michael Ott, Chris Garrett and myself) conducted a field experiment in Juan de Fuca Strait south of Vancouver Island. Here we deployed two bottom mounted 300 kHz ADCPs and profiled with a CTD, a microstructure profiler (FLY IV) and a shipboard 150 kHz ADCP. The bottom mounted ADCPs were housed in an aluminum bracket. The ADCPs were gimbaled so that they would point directly upwards regardless of the tilt of the bottom. The lower left photo shows one of the brackets on the deck of UVic's R/V Strickland before deployment. Deploying gear (throwing it over the side) is easier than getting it back! Although we got both ADCPs back, one had tipped over just after deployment and recorded three weeks of velocity profiles into sediments. The second got it's recovery line wrapped around the floatation by the strong tides. After releasing the anchor, the unit only came up half way. Fortunately the weather conditions this August day were calm and sunny (as they usually are in the Victoria area! ), so we grappled with the ship's anchor and easily hooked the snarly mess. Here we are (lower right) sorting out the tangled line with the instrument still hanging below the boat. With patience we brought back the ADCP, which recorded excellent data. Now Michael has written his thesis. Here is a small page dedicated to how we deploy ADCPs. The data revealed many interesting circulations, some like the tide were expected, while some structures in the mean flow are quite baffling. For example we see a persistent cross channel secondary circulation at the interface between the fresher out-flowing surface water and the salty return flow below. We had anticipated that this secondary flow might resemble an internal Ekman layer, however the measured secondary flow is in the opposite direction! (Is Juan de Fuca in the southern hemisphere? Or is there some sort of Stokes drift from tidal deformation?) Shown in this color figure (click for full size) are U and V velocity components for 24 hours on July 7, 1996. There is a mean Estuarine "out" (negative) flow at the surface (upper 80 meters) and a mean return flow (positive) at depth. Superimposed on this are the tides, dominated by the semi-diurnal component. The microstructure data (not shown) revealed strong "bursts" of mixing during slack tide. These bursts seemed to coincide with the location of zero velocity (which migrates vertically at slack tide), perhaps indicating the existence of a depth variable critical layer for internal wave absorption. Over the next few years (1998-2002) we deployed over 30 moorings in Juan de Fuca and the southern Gulf Islands to measure tides, mixing, internal waves, Lee waves, and wakes. More recently (2002 onward) I've shifted my focus into the Strait of Georgia, near Vancouver BC. This large in-land basin is feed directly by the Fraser River, which introduces a shallow buoyant layer above a deep 300-400m tidally driven enclosed body of water. The VENUS cabled ocean observatory has one of it's two arrays located here, where we measure currents (150 kHz ADCPs), water properties (CTD, turbidity), dissolved gases (i.e. Ox), ambient sound, and active echo-sounders. Data from these sensors is available both in live feed (CTD scalars) and/or downloadable in plot of data file formats. VENUS is presently the worlds most advanced cabled coastal ocean research facility. I am the Associate Director, Research for VENUS, and have been involved with the project since it's inception in 2001. Researchers can plug their own instrument systems into VENUS and gain interactive control from anywhere on the Internet. Shown to the left is the chart of the Strait of Georgia array with two Nodes at depths of 300m (Central) and 170m (East), and the Delta Dynamics Laboratory at 40m. 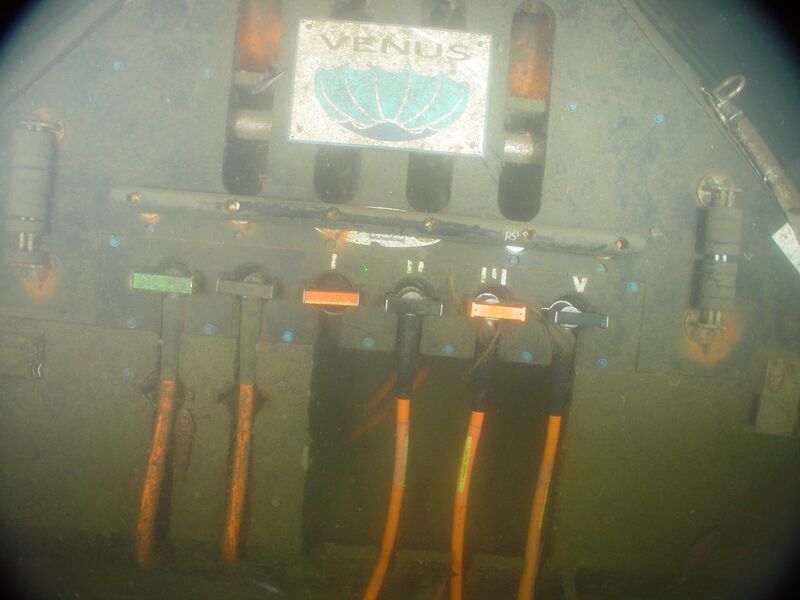 The image to the right is a ROPOS ROV photo of the Node in Saanich Inlet, showing the fibre optic connection from the backbone cable to the Node (green handle), the 360 VDC power to the Node, and the four science ports supporting ocean research. In 1993 I started modelling ocean dispersion, with a direct application of simulating the disposal of anthropogenic CO2 in the ocean. I've worked with two models, a Global Carbon Cycle Model which includes a 3D circulating ocean in collaboration with Dr. Robert Bacastow of Scripps, and my own mesoscale dispersion model which uses the time-dependent 3D currents generated by the POCM model (Semtner and Chervin, 1992). Figure 1 shows the spatial distribution of injected (1000m) CO2 near New York after 10 years at 25m, 225m, 1000m and 3000m depths. Log10 CO2 concentrations are plotted. The Gulf Stream advects CO2 into the north Atlantic, where it convects vertically to both the surface and deep Atlantic ocean. Once near the surface, some CO2 leaks into the atmosphere and is quickly distributed across the entire globe. The portion of CO2 that convects into the deep thermohaline circulation is effectively sequestered from the atmosphere for many centuries. Figure 2 shows the simulated CO2 plume from a multiple injection (1500m, 1700m and 2000m) simulation east of Cape Hatteras from the mesoscale dispersion model. The figure shows CO2 advecting and diffusing towards the northeast (main gulf Stream extension) and south (Gulf Stream undercurrent). CO2 concentrations are increased by 5 to 10 % on average, while peak CO2 concentrations can reach 1000 micro-mol/kg. The mesoscale dispersion model uses a stochastic particle tracking algorithm and has statistically well bounded dispersion characteristics. It can be used to track the dispersion of any material, anywhere in the ocean. I've added a synthetic drifter capability and can generate drifter tracks for fixed depth, isopycnals, isobaric, or any other drifter type of interest. These modelling efforts were funded by DOE and MIT. Check out my oceanographic Mooring Design and Dynamics programs [now published in Marine Models Online, Vol(1), pp 103-157], written for MATLAB. This GUI application allows a user to design and evaluate oceanographic moorings and towed bodies under the influence of time dependant 3D currents. There is a preliminary database of components from which to build a mooring or towed body. For moorings, the influence of sheared 3-dimensional currents can be evaluated, and the required anchor mass is estimated. For towed bodies, the depth of a body towed at a fixed speed can be estimated, or the wire length necessary to reach a desired depth can be sought. The latest version (v2.0) of the program files are available for anonymous FTP. Please send me notification if you find any bugs, have problems or have any suggestions for improvements. Below are some of my HOT LIST destinations that offered good value for limited surfing time. I started this list in 1993, when the world wide web part of the Internet was so young that search engines did not exsist and finding stuff was hard. MOSAIC used to publish a list of the latest web sites, at first weekly, then daily, as they came on-line. Then Alta-Vista developed a search engine with a small database of all web sites. When there were only a few hundred, or even a thousand, I guess you could list them all! Some on my list are research oriented sites, others are merely useful Internet places. Once you had found one that was useful, not only did you save it to your favorites list, but we needed to share our favorites. Surfing really was hard work, lots of time wasted trying to find good resource sites. See what you can find today without using a search engine! Just use/follow links from other pages. See if you can find anything you would add to your favorites list. Now you see why we shared our Hot Lists. Now with Google etc. we don't even need a favorites list function, let alone other people pages listing their favorites! Hahaha. Most of these sites are now long dead, but here goes for old times. First are some oceanography and related links. Some are good starting places with more links, some show model and real data through fancy images, others are data archives. Here is my ancient List of useful oceanography links. My office on the University of Victoria Campus is in the TEF Building. There are a variety of research groups here associated with Ocean Networks Canada. UVic's Climate Lab is second to none. The World-Wide Web Virtual Library: Oceanography is a great starting places with links to almost every Oceanography resource known on the net. This is an amazing Software Site, listing most known/available computer software packages from all over the world. The Oceanography section includes many useful packages and utilities (including my Mooring Design and Dynamics Matlab package). The US Department of Commerce agency NOAA has a good home page and provides numerous links to other US government agencies and departments related to the ocean and environment. The latest world Satellite image and global weather data are available at Intellicast. View the Latest set of clouds to hit our beautiful west coast. Tidal predictions, both elevation and currents (where available) can be obtained from the Tide/Current Predictor which uses the XTide program. This site has an extensive list of constituent locations. Coastline data at various resolutions can be obtained from Coastline Extractor . The data can be saved in various formats and easily read into programs such as MATLAB. They used to have a bathymetry extractor, but due to copyright laws, they couldn't provide an Internet link to a commercial CR-ROM. I use MATLAB to do various analyses and data presentations. Their site has a good archive of MATLAB routines and hints. Mathtools provides an alternate environment for MATLAB execution, and includes additional utilities for C++ conversion, compiling and standalone execution. They also have links to many user developed packages. Global change research and related topics can be found at GCRIO Library Holdings and the Carbon Dioxide Information Analysis Center (CDIAC). A good literature reference resource is the NOAA Library in Seattle, which can be searched for a variety of topics, papers, documents, which then can be ordered. They also provide links to many US Government agencies. These sites are not necessarily research oriented, but have been of interest to me. Google and Altavista are good search sites. Start here if your looking for something on the web. Google is my browsers start-up page. SubSpace/Continuum PowerLeague. OK, I used to play a computer game. It was called SubSpace, now Continuum. It's for Internet players only. Basically, you log on to a server, fly a space war ship around a 2-D maze, killing enemy ships, and scoring goals. It's addictive. I don't play in the "leagues" much, but frequent the public arena. VIE gave up the software project, so it's free. You can download the last versions at: Continuum "Meet people from all over the world, then kill them." It's now called Continuum, I play in the Powerball arena exclusively, and my name is Splunge! I live in the greatest city in the world (really!). If your travel plans can fit it in, check out Victoria, B.C., Canada. Use the local transit Buses (my wife may drive you where you want to go!) to get around. CNet Computers.com is a virtual store with lots of HOT LIST items including computer peripherals, reviews, and great prices. ESPNet and USA Today are links to the latest news and sports scores, with lots of team/player statistics. Monty Python's Flying Circus. Say no more. Here's a list of the Top 1000 Rock'n'Roll songs of the Millenium. Subspace (Continuum): Meet people from all over the world, then kill them. Oh the 1990's!